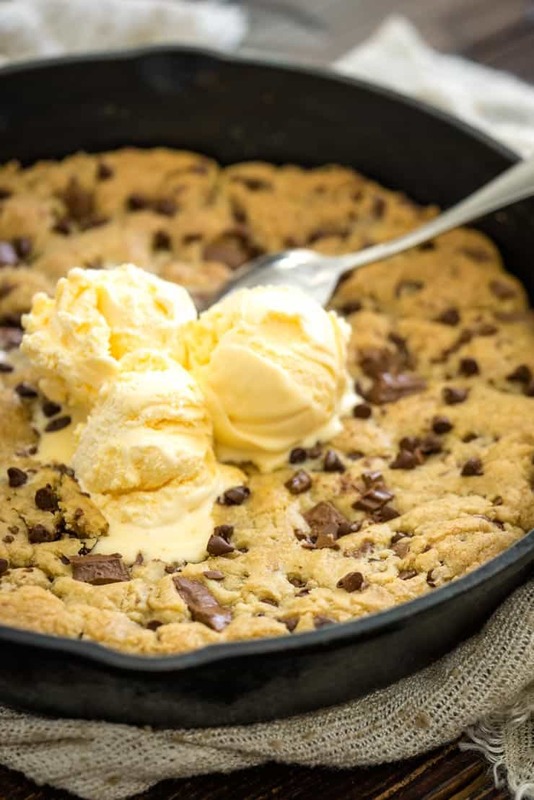 Chocolate Chunk Pizookie (Skillet Cookie)- Make BJ's Dessert At Home! This Chocolate Chunk Pizookie is out-of-this-world delicious and the perfect indulgent dessert to make when you don’t have a ton of time or don’t want to dirty a bunch of dishes! One pan, half-baked cookies for the win! I’ve been making variations of this chocolate chunk pizookie recipe for years and I figure it’s about high-time I share it with you. I honestly don’t know why I waited so long. It’s one of our favorite quick and easy desserts and everyone that I make it for wants the recipe. 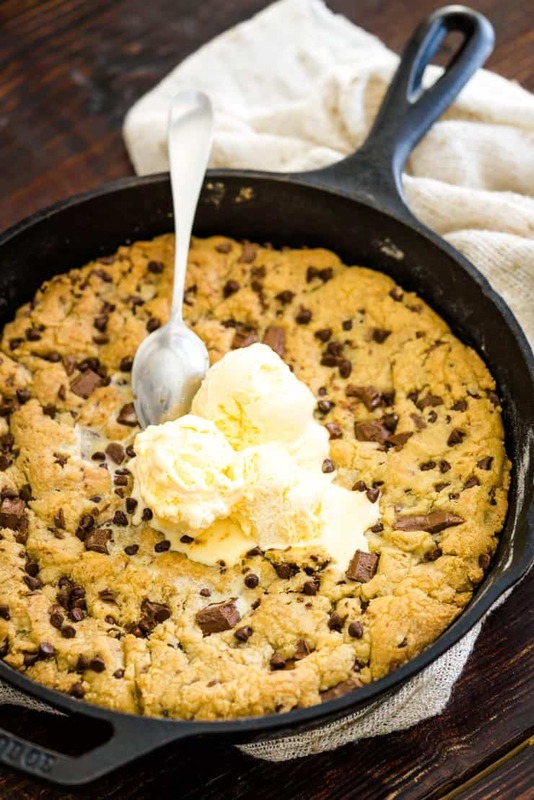 You might know them as skillet cookies, but we like to call them Pizookies! A pizookie is basically a giant cookie baked in a skillet. It’s pizza (because of how big and round it is) + cookie. Piz-ookie! But, this isn’t just any cookie. The magic of the pizookie lies in the warm, soft center of the pan. They are typically under-baked just a bit so you end up with a crunchy, caramelized outside and a soft, warm, gooey center. It’s magic. BJ’s Restaurant has brought the Pizookie into fame. They have lots of different flavors and even though I can make them at home, I still love to share the Pizookie Trio at BJ’s with a friend every now and then. How Do I Serve a Pizookie? 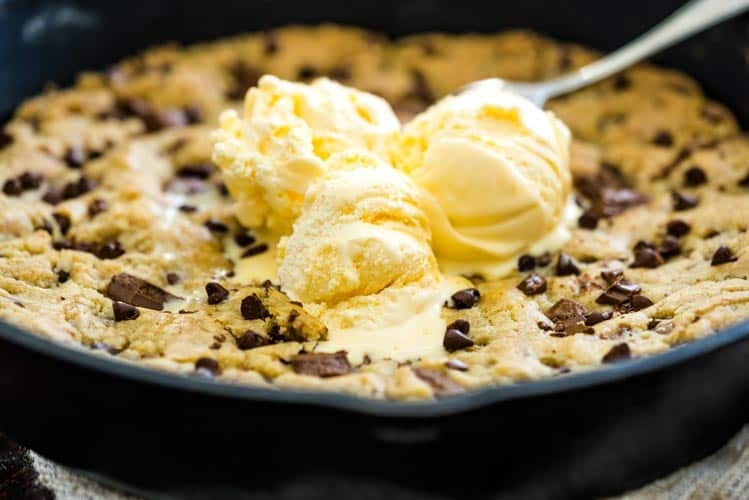 I think the best way to serve this Chocolate Chunk Pizookie is with a few scoops of vanilla ice cream scooped right on top and 4 or 5 spoons to dig into it with. The ice cream melts right over the warm cookie as you eat it and food always tastes better when it’s shared. Use a 10″ cast iron skillet– This recipe is written for a 10″ skillet, like this one . If you don’t have a 10 inch skillet, you can use an 8 inch pan but your pizookie will be thicker and you may need to adjust the cooking time a bit. Cast iron skillets are great for this because they cook the cookie evenly and give a nice, crunchy crust. Non-stick skillets will work for this as well, you’ll just have to be careful not to scratch the coating when serving it up. Melt your butter over low heat– When melting the butter, keep it over medium-low heat so you don’t accidentally burn the butter. The heat just needs to be high enough to melt the butter. That’s it. Watch your pizookie at the end of cooking– Part of the magic of the Pizookie lies in its soft, warm center. You want the skillet cookie to be golden brown around the edges and still soft in the middle. 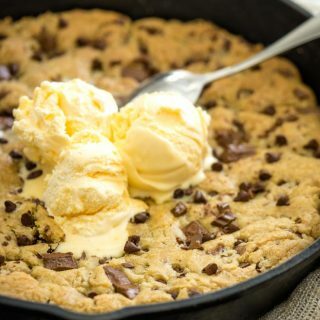 If a big 10 inch pizookie is just a little bit too much for you, try out this Microwave Chocolate Chip Pizookie Recipe. It makes just enough for 2 small pizookies and cooks in under a minute! And once you have that microwave recipe mastered you can try out these microwave hot fudge and coffee cakes. If you’ve tried other microwave mug cakes and weren’t impressed, I hope you give these ones a go! Everyone that tries them agrees they are the best! This Chocolate Chunk Pizookie is out-of-this-world delicious and the perfect indulgent dessert to make when you don't have a ton of time or don't want to dirty a bunch of dishes! One pan, half-baked cookies for the win! Melt butter in a 10 inch cast iron skillet set over medium-low heat. Stir in sugars and vanilla and remove from heat. Let rest until pan is just warm to the touch, but no longer hot. About 5 minutes. Crack an egg onto the butter and sugar mixture, and use a fork to whisk it into the mixture. Place flour, baking soda, and salt on top and carefully stir into the mixture until smooth and well-mixed. Stir in chocolate chunks and chips. Place in the oven for 15-25 minutes or until golden around the edges and still soft in the middle.